Last year when I started my blog in the Fall I was still learning when Christmas rolled around. Even knowing how to do pre scheduled posts this year I struggle to keep up with them, and this time of the year I am lucky to get on for even a few minutes. Koodos to all who are still going strong with Christmas posts, I still enjoy reading through them all when I get a chance, next year all the more reason for me to start my pre posts in September. I wanted to swing by and share some of my upcycles from the past few years that I was unable to share here yet. 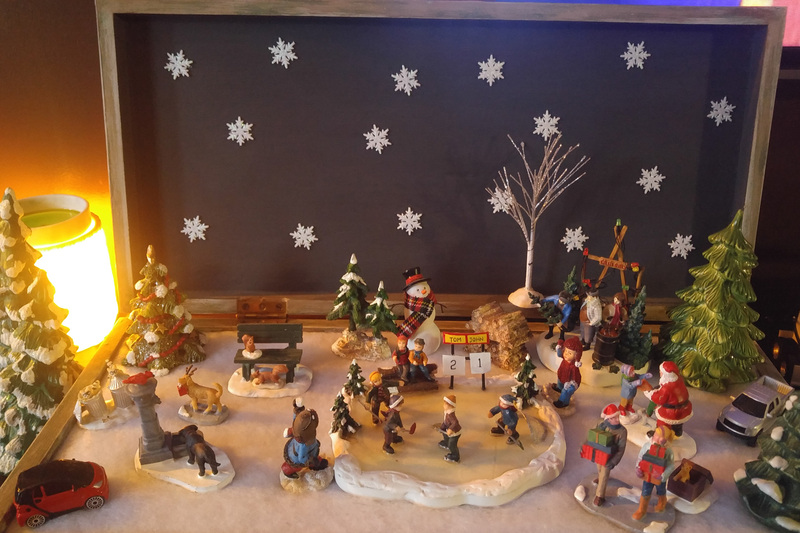 I made this last year or the year before, I took a thrifted flatware case and turned it into a Christmas miniatures display. The Figures are from Micheals, thrifted, and Dollar stores. The rink with the kids playing hockey is a vintage find from a thrift store. The back right corner is a licensed Christmas Story collectable of them getting their tree, $3 thrifted in the box, and it lights up! You can see my wax melting pot glowing, I love seasonal wax tarts, during Christmas I enjoy tree scented ones. This transport truck was found at a Value Village, still sealed in the box ( there was 2 but we only took one home). Of course it’s Canadian Tire and it is synonymous with being Canadian so I probably would have snagged it up regardless, however this has sentimental value to me. I’d be lying if I said I remember correctly but I am pretty sure it is the same truck my brother had, or rather should I say one of many. I know whole heartedly that my dad gave my little brother one, at Christmas for many years in 1980 something. None of them survived his imagination where he would pull them apart in no time to see how they worked and to rewire them. It is remote control and takes big c batteries. I wanted to “strap” a tree to the top, I looked high and low for one, but they were all to fake ( mostly bottle brush type), hubz said to go to the model- hobby shop but I wasn’t willing to pay what they cost there! I knew what my vision was and I achieved it by hot gluing stems off an old faux Christmas tree to a dowel in an upward direction. I had purchased some pine cones that year, and I wrapped my new tree in the netting they came in. This last upcycle was made last year, during our flood, the stable that I made with my daughter who is 22 ( only daughter, 3 boys 1 girl) when she was 7 at school, survived. Truth be told it was wet but there was no way I wasn’t saving it. It use to have a paper nativity scene that she coloured and we glued to wood and into the stable but it had broken off long ago, still I kept this all these years in the storage room. I kept meaning to turn it back into a nativity scene but we had to downsize ours to a minimalist carved one that sits on a shelf because the cats kept swatting baby Jesus all over the house, no matter how much hot glue I used they popped him out lol. With emotions running high last year, I couldn’t return this stable back to the storage room! I had to breath new life into it. I love Holstein black and white cows, besides cats and dogs I’d love to have a pet cow, ok a pet cow, owl and bat. As you can see I turned it into Christmas cows, I have no before shots but it was just stained wood, I painted it to be a “barn”, the cows are from Micheals with 55% off coupons. I purchased the John Deer at Canadian tire ( on sale of course, we love our Canadian Tire sales in this house!) and made a tree similar to the one on the transport truck. You’re a bargain shopper…Love it. You are one of my people for sure. I am sure I drive everyone crazy telling them all about my great deals all the time, but I want others to also see that it doesn’t take a lot of money to pretty up our worlds. These are all great upcycles, you are very creative. The tree looks so real on that truck. So funny that our animals always take out the nativities. My cats love playing with my nativity sets too…little monsters. I started my pre-posts in September so it helps a ton. We try to get out and do family things for the holidays instead of buying a ton of stuff, we do road trips and Christmas events mostly. It gets hard to posts and do all the holiday things too. I am already thinking about flowers/Spring/Easter which is my second favorite season. Hope you are feeling better and having lots of fun with your family. Well, I also hope you guys don’t get the flu. The parents have to keep everything running smoothly during the holidays, it is never good when they get sick. Eat lots of soup and oranges. Not sure if oranges are easily available where you are at but here in Arizona they are everywhere. We have horrible pollution at the moment in our city. Everyone I know is suffering from burning throats, drippy noses. bloodshot eyes and having a hard time breathing. We have to stay indoors to avoid it when the days are bad but hey, we have a lot of oranges in our city. Have to be happy for whatever positive we can get. We might head up to the mountains for some clean air to the little red house. There is snow in the forecast for Christmas up there so we’ll have to see what the road conditions are like first. You and your husband stay healthy and have a great Christmas. I am off now to write the last 12 days of Christmas crafts post. Things are a bit of a mess with the days so will have to go back and fix all that as well.